The study material is based on those sections of the Companies Act, 2013 and the rules made there under which have been notified by the Government of India and came into force w.e.f. April 01, 2014 (including Amendments/clarifications/circulars issued there under upto June, 2014). In respect of sections of The Companies Act, 2013 which have not been notified, applicable sections of Companies Act, 1956 have been dealt with in the study. Company Secretaryship being a professional course, the examination standards are set very high, with emphasis on knowledge of concepts, applications, procedures and case laws, for which sole reliance on the contents of the study material may not be enough. Besides Company Secretaries Regulations, 1982 requires the students to be conversant with the amendments to the laws made upto six months preceding the date of examination. 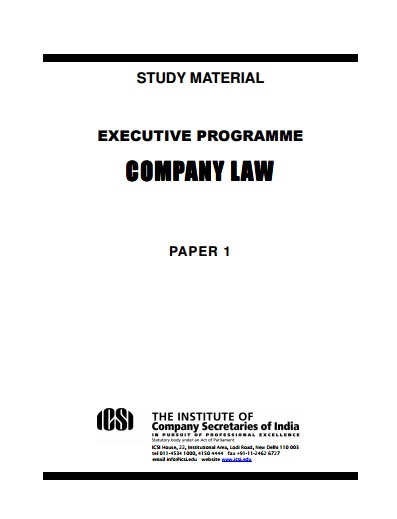 This study material may therefore be regarded as basic material and must be read along with the notified provisions of companies Act 2013 and rules made thereunder and the provisions of Companies Act 1956 which is still in force. The amendments made upto June 2014 have been incorporated in this study material. However, it may happen that some developments might have taken place during the printing of the study material and its supply to the students. The students are therefore advised to refer to the bulletin 'Student Company Secretary' and ICSI Journal Chartered Secretary and other publications for updation of study material. In the event of any doubt, students may contact the Directorate of Academicsat academics@icsi.edu. Although due care has been taken in publishing this study material yet the possibility of errors, omissions and/or discrepancies cannot be ruled out. This publication is released with an understanding that the Institute shall not be responsible for any errors, omissions and/or discrepancies or any action taken in that behalf. Should there be any discrepancy, error or omission noted in the study material, the Institute shall be obliged if the same are brought to its notice for issue of corrigendum in the e-bulletin' and Student Company Secretary'.